I love a good frittata for Sunday brunch. What I find amazing abut this dish is that it is a one dish meal. It has lots of veggies, eggs for proteins, it tastes delicious and it is so easy to prepare. Plus you can add basically whatever you like in it, as much or as little as you want. 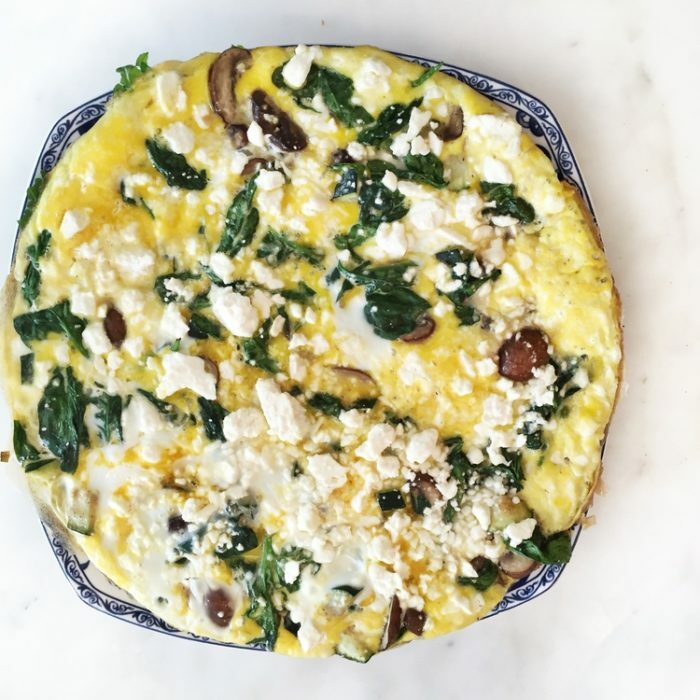 This week I went for mushrooms, spinach and feta, my kids devoured everything to the last bit... I serve it with a large green salad on the side and toasted baguette. Sauté the shallots with 1-2 tbsp of grapes oil over medium heat until golden, about 4 minutes. Add mushrooms and cook fro 2-3 minutes then add spinach and toss for another couple minutes. Meanwhile beat eggs and salt to blend in large bowl. Pour egg mixture over the veggies and cook over medium heat until frittata is just set at edges, about 5 minutes. Sprinkle the feta all over and transfer to oven and bake until just set, about 20 minutes. Cut around frittata to loosen; slide out onto platter.